A friend asks you to go kayaking with her. She’s leaving now. It’s the last minute and you’re freaking out: what should I wear? Will it be windy and cold, or hot and muggy? What if I get wet? These concerns are entirely valid. Kayaking is not sitting in a climate-controlled theater. It’s an activity that forces your clothing to withstand sweat, wind, rain, sun, and maybe even your little brother’s splash attacks. Under these circumstances, normal clothing can end up being uncomfortable, or even dangerous. I’ve been out on the water plenty of times, had boatloads of fun, and lived to tell the tale. My wardrobe decisions were important, but they weren’t rocket science. Yours don’t need to be, either. In this post, I’ll outline the factors to consider when planning what to wear for kayaking and canoeing. I’ll also point out some simple clothes combinations and accessories that have worked for me in the past, so you can spend less time in your closet and more time feeling the waves beneath your boat. 1 How Do I Plan? 2 What Will My Clothes Have to Protect Me Against? 3 Which Materials Work and Which Don’t? 4 What Specific Clothes are Effective? As with any activity outdoors, start by planning ahead. Check the weather forecast. Know what type of boating you’ll be doing: will you be navigating adrenaline-charged whitewater or relaxing on a calm lake? Will you be out for hours or just for a quick paddle in the bay? As a general rule, the more extreme the conditions, the better your clothes will need to perform to keep you safe and comfortable. For a short, relaxing paddle on quiet water, just about any clothes will do. In ultra-extreme conditions, such as on a glacial river in serious whitewater, you’ll want to talk with your guide about technical gear such as a dry suit. Most of us will find ourselves somewhere in the middle. What Will My Clothes Have to Protect Me Against? 1. Water, 2. Wind, and 3. Sun. Let’s start with water. It’s what boating’s all about, and it’s a blast. But when you end up wet from sweat, churning rapids, or rain, evaporative cooling can go too far. Combine water with wind, a common environmental factor on wide-open lakes, and your blustery day just turned frigid. When you’re soaked to the skin, shivering, and a mile away from the dock, there’s not much you can do, so stop the problem before it starts. Guard against heat loss from being wet by not getting wet in the first place. Bring a windbreaker, rain jacket, or poncho, and don’t hesitate to put it on. It takes up almost no room in the boat, and if conditions turn for the worse, you’ll be really glad you have it. But you’re not planning on going out in a rainstorm, right? On the scorching summer days when we most often find ourselves in kayaks and canoes, we’re trying to cool down. And here’s where your clothing needs to protect against the sun, an especially pertinent concern because harmful UV rays reflect off the water, increasing your risk. To avoid sunburn, cover up completely, and use sunscreen on any bare skin. Let’s talk more specifically about how to cover up comfortably and effectively. Which Materials Work and Which Don’t? Because kayaking and canoeing often involve being wet, it’s important to wear fabrics that dry quickly. Cotton is horrible at this. Avoid wearing cotton shirts, sweatpants, sweatshirts, or denim jeans (a form of cotton). These get wet and stay wet, keeping you uncomfortable. Synthetic fabrics like nylon, polyester, or polypropylene are the way to go. They are comfortable and lightweight, and they dry quickly. Every brand has their own lingo, so look for general athletic wear with labels such as quick dry, performance, or moisture wicking. What Specific Clothes are Effective? For upperwear, I’m partial to Columbia’s Performance Fishing Gear line – most of these long-sleeved shirts are designed to dry quickly, block the sun, and look stylish. On the bottom, any thin, quick-drying pants will do the job, and don’t forget synthetic underwear! Bathing suits and board shorts, while comfortable, leave the lower legs exposed to sun and wind. For that reason, I always wear long pants with high UPF-rated fabrics (meaning they block UV rays that cause sunburn). Columbia offers plenty of solid options. Footwear: For their comfort and quick drying properties, sandals are a popular option. If you’re going into whitewater, wear closed-toed shoes to protect your feet or sandals with multiple straps that will stay on, like Chacos or Tevas, not flip-flops. Remember to sunscreen your vulnerable feet and ankles. Headwear: There’s no substitute for a wide-brimmed hat to protect your face and neck. Be sure that the brim extends around the back; a baseball cap won’t shield your neck. The cowboys had it right. Eyewear: It’s always important to protect your eyes, even under a hat. Sunglasses are a must. Polarized lenses can help you see through light reflecting off the water, and don’t forget a retainer, aka croakies! The last place you want your sunglasses to end up is on the bottom of the lake. Deciding what to wear when kayaking doesn’t need to be stressful. Check out Columbia’s PFG line, or for a wider selection of multiple brands, head over to REI’s paddling apparel section. Put off by prices? Your active apparel decisions also don’t need to be expensive or complex. If you’re looking for something, anything, to get out there on the water, the best option is what you already have in your closet. Your favorite exercise shirt, everyday sunglasses, and a clear weather forecast will do the job. 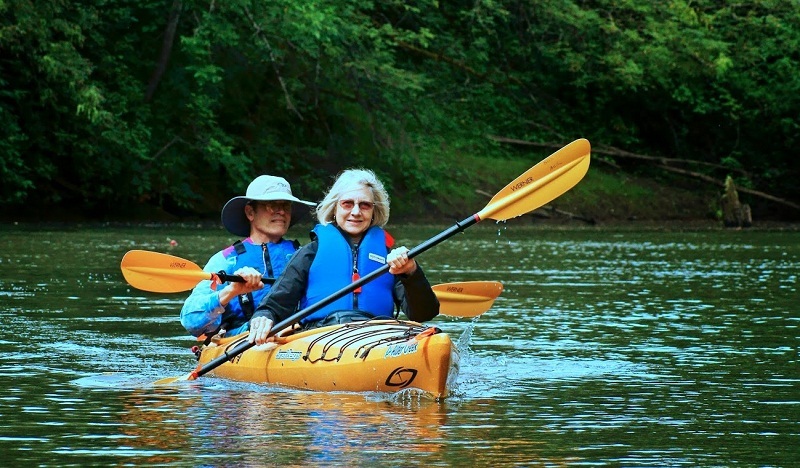 What clothes have worked for you when kayaking or canoeing? Share your comments below. thanks for this information I was wondering that I would get a good knowledge that what to wear while fishing this article helps me a lot.